ACHAIA, THE IDEAL DESTINATION FOR INCENTIVES, CONFERENCES, CONGRESSES, MEETINGS, BUSINESS TRAVEL, INTERNATIONAL CULTURAL AND SPORT EVENTS. Welcome to the prefecture of Achaia, the cultural centre of Peloponnese with the lively city of Patras to leave no visitor dissatisfied with monasteries of historical importance, breath taking landscapes and dense vegetation, blue flagged awarded beaches, a ski centre, rivers, lakes, gorges and caves, all creating a picture of an ideal destination all year round. 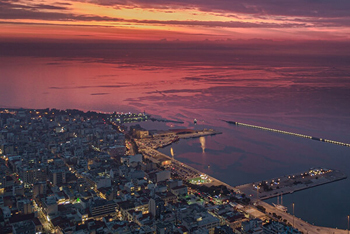 Visit Patras with its intense cultural activity housing the cathedral of St Andrew, a city of significant Archaeological interest as well as Kalavrita with the monastery of Agia Lavra to admire the place where the Greek revolution against the Ottoman Empire was born. Crystal clear beaches such as Kalogria, Lakkopetra, Aktaio, Digeliotika and Pounda as well as wonderful seaside villages such as Selianitika with its mineral springs and a small balneological bath spa, along with the casino in Rio overlooking the newly constructed awesome bridge to offer high end accommodation services and facilities, are only some of the most distinctive points of attraction along the area. Visitors of all interests can find their ideal destination in Achaia. Holidays of archaeological interest, relax holidays along its coastline at the area's luxury hotels and spa resorts with high European standard conference facilities, religious and thermalism tourism, outdoor activities, mountain and water skiing, trekking, caving, climbing, bird watching, horse riding etc, and a tour along the wine roads of Achaia with historic estates, are only some of the factors to make Achaia a must visit destination. Achaia and its capital city Patras can be accessed only by road as there is no airport in the area while the railway line of the area is currently under construction. Rent a car or use of the national coach services to reach the area from Athens. 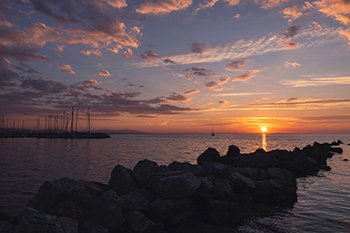 On the other hand, as Patras is one of the greatest ports in the country, there are regular connections between the port and the neighbouring island of Ithaca, as well as Corfu and Igoumenitsa. Finally, this is the place to be, when wishing to combine your visit in Greece, along with one in Italy as high standard vessels reach the ports of Venice, Ancona and Bari. 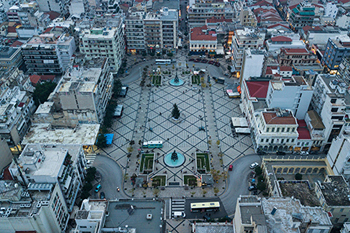 Greece's third largest city, and second busiest port as the primary sea-passage from Western Europe to Italy as well as the Ionian islands, the city of St. Andrew, Patras is a modern economic, commercial and cultural centre being the cultural capital of Europe for the year 2006, to host top art performances and conferences. With parks and squares, while being one of the most inexpensive areas in Greece, visitors of Patras have the opportunity to discover events and activities to satisfy various interests in culture, monuments, arts and sports. Other than the historic and religious significance of the area, Kalavrita is also well known for its ski centre of Helmos, the famous Caves of the Lakes, a rare and wonderful creation of nature with stepped lakes in three levels and original shapes of stalactites and stalagmites, as well as the deep ravine of the river Vouraikos that amazes every visitor with its wild beauty. The area is ideal for trekking but riding the vintage cogwheel train is an experience not to be missed. 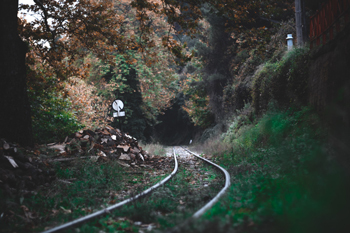 This narrow-gauge railway that runs to Diakofto on the Gulf of Corinth, offers one of the most spectacular railway journeys in Greece, with beautiful scenery and imagery while passing through various tunnels and narrow mountain gorges as well as some original steam engines originally used, now situated at each of the two stations. The most recent while significant in terms of transportation ease as well as a constructing achievement is the new Rio – Antirio Bridge. The Olympic flame being the first to use this overpass to connect the Peloponnese with the Greek mainland, during the Athens Olympics of 2004, celebrated the opening of one of the longest cable bridges in the world. 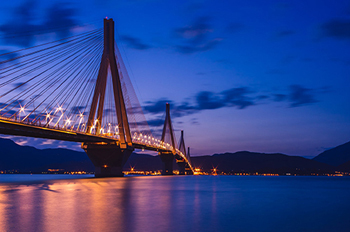 Its size, makes the bridge hard to miss from most of the seaside points of Achaia, while its night lights give a spectacular view of its this highly advanced bridge. 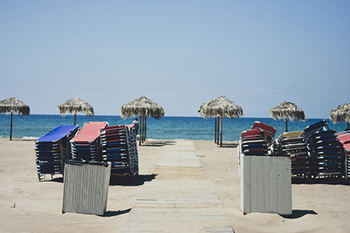 Amongst the most popular destinations of Achaia, is Kalavrita. The historic monastery of Agia Lavra, other than an exquisite example of architecture built around the entrance of Mega Spileon cave, on the wild and steep side of a 120-metre high rocky hill, is the symbolic birth-place of modern Greece, as the flag of 1821 Revolution of Greeks against the Turks was raised here. Although the monastery has been destroyed four times including the one during the World War II where actually all males of the area where executed, nowadays the monastery hosts significant heirlooms as the flag of the Revolution, the sacred vestments of Palaeon Patron Germanos, the diamond-stuck Gospel, ecclesiastical objects, a library including 1.000 volumes of books and manuscripts of codices dated back to the 11th century and most of all the Sacred Icon of Theotokos which according to the tradition has survived all the destructions that took place at the monastery. The significant history of the area starting from the Mycenaean period to the Roman one and finally reach the Byzantine era and the Ottoman Empire, is well illustrated in the Archaeological Museum's of Patras and its archaeological sites. Its stunning galleries are laden unique finds including tools, cups, and jewellery reflecting everyday life in the Peloponnese, while numerous mosaics from Roman villas around Patras have been reassembled, along with many items from the ancient Roman Odeon, still hosting performances and cultural summer events. The reconstructed Mycenaean Tombs revealing 45 domed graves, the Frankish and Venetian Castle with its panoramic view of the city of Patras and the harbour, the Hammam, one of the very few original Turkish baths to be found in Europe and the Apollo Theatre operating as the local opera house, are some of the archaeological sites of the city worth visiting. Once visiting Patras, one cannot miss St. Andrew's Cathedral, Christ's first summoned disciple where he was taught and martyred in 66 AD having as a mission to spread Christianity throughout Greece. As a pay of respect and honour, residents of Patras built the largest church in the Balkans (5500 persons) becoming one of the most important pilgrim sights across the country to house the relics of the Apostle and a piece of the cross where he martyred. The prefecture of Achaia offers a large number of outdoor activities throughout the year. Wonderful beaches, rivers, lakes, lagoons and mountains in a background of forests and dense vegetation become the ideal destination for sports and nature lovers. The numerous beaches along the coastline of the area with crystal blue waters awarded with blue flags, offer are fully equipped to offer sea sports such as water skiing, wind surfing, canoeing sailing and ship wreck diving. The countryside offers opportunities for horse riding and slope-parachuting while the ski centre of Helmos next to the city of Kalavrita is the place to be for skiers and snowboarders. Strophylia Forest, being protected by the International RAMSAR Convention, features interesting flora, fauna, wetlands and an impressive sandy beach 22 km long ideal for bird watching. The highlands of the area are must visit for hiking, trekking, river trekking, kayak, rock climbing and caving. Last but not least the port Rio Hotel and casino is worth a visit for amusement while offering a magnificent view of the bridge. Having a long tradition since 1861 with the arrival of the German, Gustav Clauss to establish the world known oldest winery in Greece Achaia Clauss Winery hosted in a Bavarian-style castle, to follow the Empress Elizabeth of Austria in 1885 to discover the area's potentials, Achaia is currently one the largest producing areas in Greece to generate some of the finest world known and awarded wine varieties across the country. Hiking the wine roads of Achaia is a journey to unique flavours and aromas to reach vineyards and estates so as to taste the local strong and lingering Muscat, the deep red sweet Mavrodaphne (named after Clauss' beloved woman) and the delicate and floral Roditis. 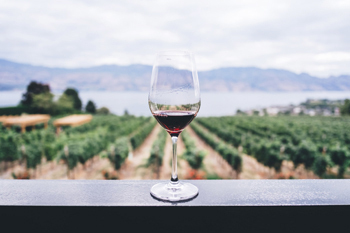 Wine experts offer thorough tours around the vineyards, production units and cellars to reveal secrets of wine making, while tasting the exquisite local varieties. The Imperial Cellar winery with its enormous vault contains casks from every vintage, each dedicated to a head of state or visiting dignitary, being an old tradition originally initiated in 1885 that survived throughout the centuries. The prefecture of Achaia offers a culinary delight for all visitors. Local products of exquisite taste and top quality are found in every local dish. Olive oil, diary products and especially the world known feta cheese, traditional bread and pasty products, as well as collection of wild greens, honey and raisins are only some of the extensive list of local delicacies not to be missed. Near the rivers and lakes of the area, fresh trout and salmon are offered, while local organic meats are to be found at the small taverns around the traditional villages of the area. Last but not least, grape products other than the world famous wine of Achaia with its numerous wineries, is the sweet red wine Mavrodaphne along with a cinnamon flavored liquor, Tendoura, to be offered as a digester after every meal. Dating back to 1829, when a merchant started hosting a carnival dance at his private premises, to gradually assimilate customs from different regions of Ionic Islands and Italy, the Patras Carnival is the largest in numbers and participants across Europe. Preparations for the festival last for a whole year in order to prepare for this mega event to include balls, parades, hunting of hidden treasure, kids' carnival etc. Its peak celebrations take place during the last weekend of the 40 day festive period with the Saturday evening parade of carnival groups, the extravagant Sunday parade of floats and groups, to conclude with the final ritual of burning the King Carnival at the harbor followed by concerts, dances, a farewell to the carnival past, announcements about the carnival to come and countless fireworks. During these days the carnival spirit enters every Achaea house while the everyday life in the city of Patras changes radically as thousands of visitors from all over Greece and neighbouring counties actively become a part of the celebration to experience unique moments, full of fun, colours and music.